And it was dark again in the abyss of emptiness. Drenched in cold sweat I was scared! As it lurked ominously in the binge! It was the silence before the storm, before the wild rampage. Alas! I was but in a fight with myself! The innocence of a sweet little kid! I was the frog in the well! I was the creator of the hell! Will undoubtedly be something not easy! But then I am bound by time! Surprised … Touched … & Inspired to write even more!!! It has been a little more than 3 months for me here on WordPress. Growing up, I have always been very secretive about my writing, never came out in the open with this hobby of mine. Maybe because of the people around me, maybe because of the lack of self-confidence in me, or maybe I was too indolent, don’t know why. It’s just that one fine day I was going through an article here on WordPress, when I thought even I could share things that I write, few haphazard lines of rhythm and rhyme. Who knows, maybe there is more to these scribbles than my underestimating heart can fathom. “The Most Versatile Blogger” nomination some days back was great. 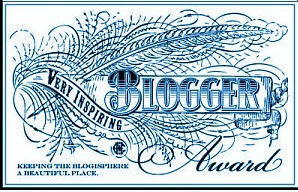 Now, to be nominated as “The Most Inspiring Blogger Award”, it means a lot a lot to me than it meets the eye. Sincerely, it does that too coming from someone whose blog has simply been a real source of inspiration for me…Soumya. My heartfelt thanks to you, Soumya (http://soumyakepankh.wordpress.com/ and http://soumyav.wordpress.com/ ); really appreciate your gesture! Let me start with my name first. I am Souvik. I am an enterprise resource planning consultant. My expertise lies primarily in finance and order management. I can’t survive without MUSIC; it’s one of the most important ingredients of my life! I love reading as well, though unable to find time of late. I am very simple, straightforward but little moody at times. I am a good judge of people from a distance, but this quality of mine goes astray once the same people come close to me. At times I am a very prolific writer and then there are times when nothing comes out. This accounts for sudden time gaps in my blog. There is an agonizing number of good bloggers who keep on mesmerizing me and inspiring me. You all are nominated and each one of you deserves it to the fullest! That’s all from now. Keep blogging and keep re-discovering yourselves like I have! Scribbles of a Teenage Heart : The Promise! Please stop this killing spree! Put a lid to your murderous rage! Cut me up and leave me distressed! What can I do to stop this fray? What can I do to make you go astray? Should I stand up and look into your eyes? And you win again as you roar! Happiness, oh! that profound emotion! Something my heart is badly in need of. I will hang on with all my heart for sure! And you can bet it’ll come true! Oh ! the earth-shattering explosion! Flabbergasted at the turn of things! Gutted and annihilated in a wink of an eye! Saplings hurled to permanent darkness!